Woah! Apparently Twitter has snatched up the company behind popular desktop and iPhone Twitter client Tweetie. Twitter intends to "offer [the iPhone app] for free and rename it Twitter for iPhone." We all like free things, right? 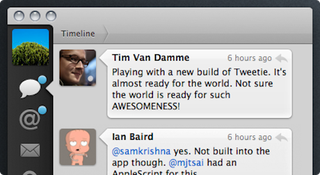 Not to mention that we'll finally get a Tweetie Twitter app for the iPad, too.